How do you like your steak? Medium rare is the answer, especially at Medium Rare in Washington DC where America meets France in a steakhouse. At Medium Rare, the words steakhouse and affordable are combined in a relaxed and fun environment. 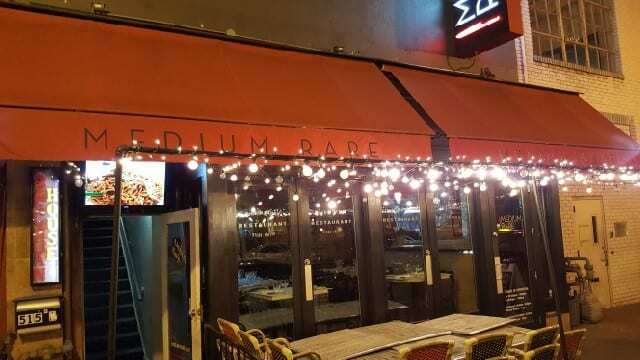 Modeled after a steakhouse based in Paris, Medium Rare has three locations in the DC area – Bethesda, Cleveland Park and Capitol Hill. The concept is warm and friendly serving up tasty food in a relaxed, non-pretentious way. The music is turned up loud, making you lean in to talk, like you would if you were in a French bistro. Hide is not fancy; it does not have modern decor or any special touches. It is straight-forward with a sushi bar that seats approximately 13 and tables that can seat about 30. They do not take reservations. When you arrive, you put your name on a white board, the number in your party and if you want to sit at the sushi bar or a table. Then you wait your turn. Your entire party must be present when a table is available and they will not seat any incomplete parties. Hide also does not take credit cards. You can pay with cash only, and there is an ATM machine inside the restaurant if you need it. Luckily Hide is not expensive. The cost is very reasonable and you can very eat well for $30-$40 per person. The menu is very traditional. There are rolls, such as spicy tuna and salmon skin, but none of those Americanized rolls, such as Philadelphia rolls. The sushi is super-fresh and the rice is served room temperature. One of my absolute favorite pieces is the albacore tuna with ponzu sauce. It just melts in the mouth.